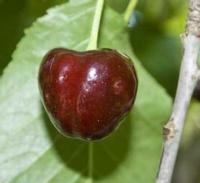 Cherries are in the spotlight from early to mid June! Enjoy them, but keep an eye out for a new cherry pest in our area, the Spotted Wing Drosophila. This is a fruit fly the size of a gnat which lays its eggs in ripening fruit. Watch for firm fruit with one or more tiny holes, or soft spots on fully ripe fruit. If the fruit has some damage, check inside the cherries for the presence of tiny 1/8 inch white maggots (larvae). 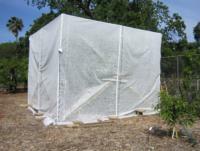 The Spotted Wing Drosophila is a pest that has been in the Sacramento area for just two years, so we are still learning the best methods to manage it. Few practical options other than spraying are available to homeowners right now, but proper disposal of infected fruit is critical. Read the UC IPM Online pest note on management of Spotted Wing Drosophila for more information on the pest and what you can do. 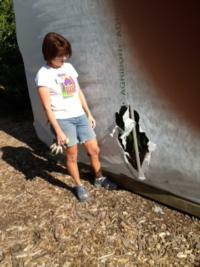 In the Fair Oaks Horticulture Center orchard, we are trying a tent made from garden row cover material. We have already had problems with tears in the fabric from wind damage and possibly from a raccoon. We lost most of our crop in 2011 to this pest, so we decided to take bold measures! See our attempt to combat this pest. Download a printer friendly version of the UC IPM Online Pest Note 74158 about Spotted Wing Drosophila management here (PDF).